View cart “Book: Counselling Insights” has been added to your cart. Trish has worked in many diverse mental health settings with families, youth and children providing direct practice for over 20 years. She has a Master of Social Work degree as well as an undergraduate degree in psychology, and has completed professional training in trauma resolution therapy. She is also a co-author of our Counselling Insights book. Trish believes that real change happens through relationship, authenticity and the use of skillful empathy. In addition to her work with CTRI, she maintains a small private practice, specializing in recovery from early adverse experiences, PTSD, anxiety, depression, vicarious trauma and burnout, and she continues to have a special passion for helping children, youth and families. As a trainer, Trish is a gifted listener who works to facilitate training that encourages genuine insight, compassion and a collective learning experience. Dealing with issues related to mental health in the workplace can be challenging and difficult to navigate. It is essential that organizations have the capabilities to manage mental health because early identification and support typically leads to continued productivity and retention of employees. 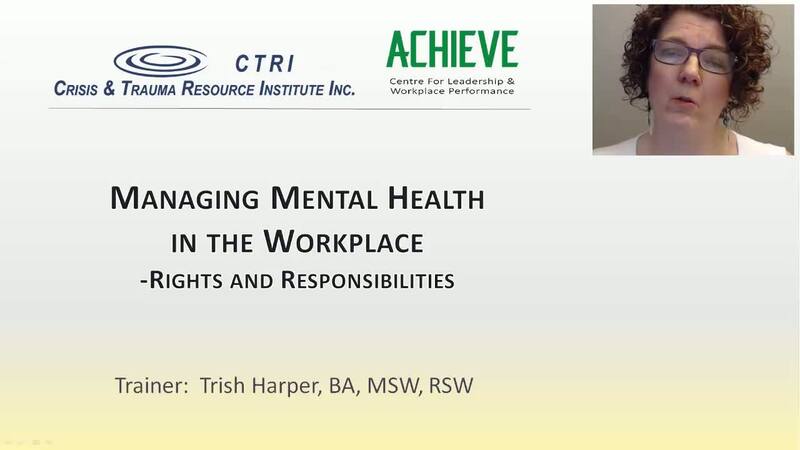 This webinar provides a roadmap to help managers participate in conversations with employees who may require support when experiencing difficulties related to mental health. Viewers will learn strategies for creating a more inclusive work environment that reduces stigma surrounding mental illness. Categories: ACHIEVE Webinars, CTRI Webinars.